Cook pasta in pot of boiling salted water until al dente, according to package directions. Reserve 1/2 c. pasta water; immediately drain pasta and then return to the pot. 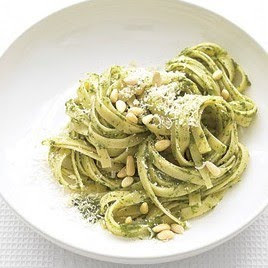 While pasta is cooking, place spinach, Parmesan, nuts, garlic and lemon zest and juice in a food processor. Process until a paste forms. While the processor is running, add oil and 1/4 c. cold water; process until smooth and creamy. Season with salt and pepper. Add to pasta; toss. Adding reserved pasta water a little at a time until sauce is thinned slightly and coats fettuccine (you may not need all the water). Serve. Sprinkle with additional Parmesan and pine nuts, if desired. In a small pot, bring rice and broth to a boil. Cover, reduce heat to low and cook for 30 minutes (if white rice reduce cooking time to 15 minutes). Remove pan from heat and let it stand, covered, for 5 minutes. Meanwhile, in another saucepan, warm beans and 1/4 c. water over low heat, stirring occasionally. Wrap tortillas in foil and place in the oven at 350 degrees to warm them, about 8-10 minutes. Let everyone build their own burrito and chow down! This was a new recipe that we tried the other night, and we really liked it. My girls actually ate it too. Surprisingly they like spinach! YEA! This is another recipe that is super easy when you want to hurry and throw something together and let it bake. Preheat oven to 375 degrees. In a large bowl, combine spinach, rice, milk, eggs, 3/4 c. Gruyere cheese, 1 and 1/4 tsp. salt, and 1/4 tsp. pepper. In a large skillet heat oil over medium-high heat. Add onion and garlic and season with salt and pepper. Cook, stirring occasionally, until onion is soft and beginning to brown, about 10 minutes. Add wine and cook until evaporated, about 3 minutes. Add ham and cook until heated through, about 2 minutes. Add ham mixture to the spinach mixture and stir to combine. Transfer to an 8-inch baking dish; top with remaining cheese. 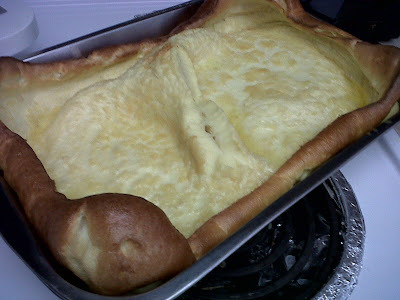 Bake until warmed through and golden brown on top, 25-30 minutes. This is one of our favorite meals. Chad and I Chinese food. So I'm always looking for new things to make to help our cravings so we're not eating out all the time. This recipe is not only yummy, but extremely easy! Heat pan or wok over high heat, add oil and swirl to coat. "Velvet" chicken. Add cornstarch, cooking wine, and 1/4 c. vinegar in a bowl. Mix. Add sliced chicken and coat with mixture. Meanwhile, add garlic, ginger, and chicken. 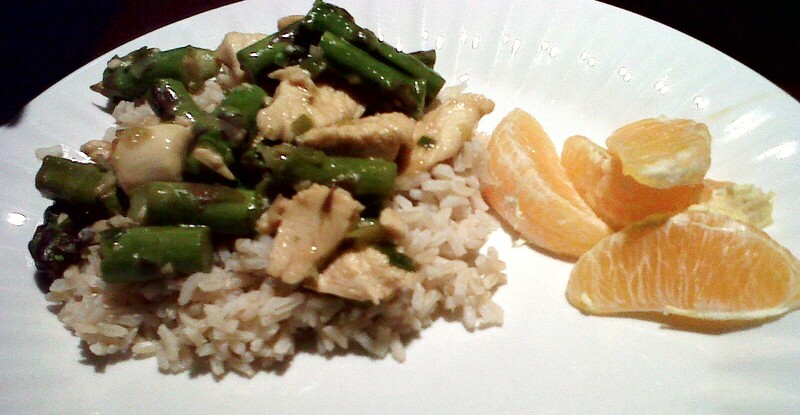 Stir-fry for 1-2 minutes, or until the chicken changes color. 4. Add green onions and asparagus and stir fry for a further 2 minutes or until onion is soft. 5. Stir in soy sauce and 1/4 c. water. 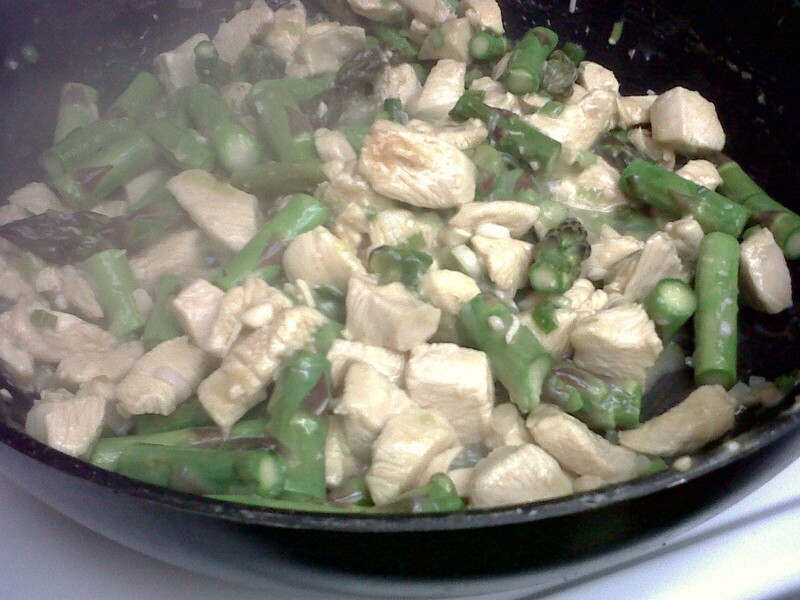 Cover and simmer until chicken is tender and veggies are tender crisp. Sprinkle with almonds. Serve over brown rice or noodles. We used to have these all the time growing up. I think they are technically called German Pancakes, but as a child we always called them Mountain Pancakes because when they came out of the oven, they really looked like mountains. In a 9x13 pan, melt butter in the oven. Meanwhile, mix the next for ingredients with a mixer. Blend well. When butter is melted, pour mix into your hot pan and place immediately back in to the oven. Bake @ 425 degrees for 25 minutes. Cut into squares and serve with jam, honey, syrup, or powdered sugar. Bring a large pot of water to a boil for your pasta. Salt you water and cook pasta al dente. Meanwhile, poach chicken. Place chicken in a small pan, and add water to top of meat but do not cover completely. Add bay leaf and bring to a boil, reduce heat and gently simmer to cook through 10-12 minutes. Shred meat into small pieces with 2 forks. 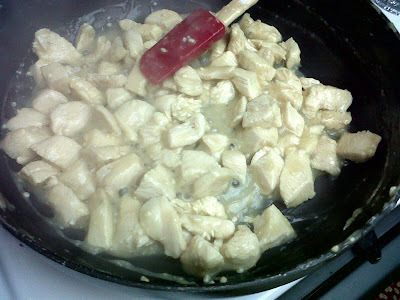 While chicken cooks heat EVOO in a large, deep saute' pan over medium heat. Melt butter into oil and add onion and garlic, season with salt and pepper and cook 8-10 minutes, stirring occasionally. Sprinkle flour over cooked onions and garlic and stir one minute then whisk in white wine (or chicken stock). Add 1 c. stock and cook 1 minute and then add cream and season with nutmeg. Let sauce thicken for a couple of minutes over low heat then stir in spinach and artichokes and heat through. Melt asiago or provolone cheese into sauce and turn off heat. Drain pasta and toss with sauce and chicken to combine, adjusting salt and pepper to your taste. Garnish with freshly grated parmigiano reggiano cheese.